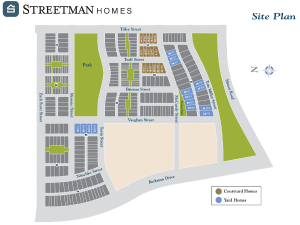 Streetman Homes have been building on and off in Mueller since 2007, and they’re back with a new release of yard homes in Section 7C. If you want to see the full range of options from all active builders, hop on over to our new homes at Mueller page. The new homes are to be built on 45′ lots – this is larger than the yard homes from Section 6, though a touch smaller than some of the original 55′ lots back in Section 4. Of the 15 home sites, several are interspersed with Standard Pacific’s houses on McCurdy and Tom Miller Streets, and four are across from the park on Vaughan Street. 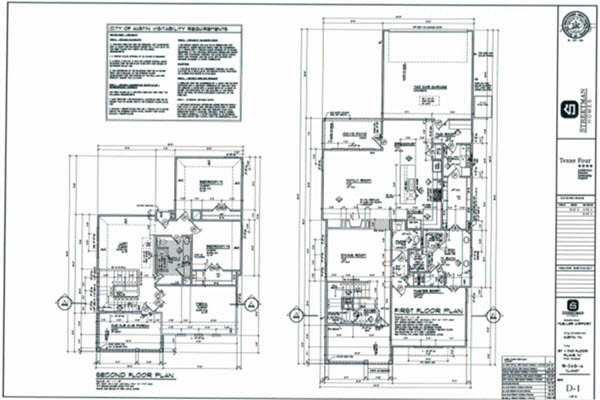 The builder was purchased last year by Standard Pacific, and is continuing to operate from it’s model home at 4500 Berkman Drive – one of the Courtyard Row Homes which it is also building in Section 7 as you can see from the plan below. Single story homes have always been extremely popular at Mueller. There were no single story detached homes built in Section 6, so one level buyers had to fight over the few resale examples in the brutal resale market for the last few years. The interesting thing to us is this provision of so many plans with a master bedroom on the downstairs or only floor. At present the only other option for a master down detached home under $650,000 is the David Weekley Antone, so it’s nice for our buyers to have some choice in their yard homes at Mueller. Scott Brodrick is a REALTOR with Sherlock Homes Austin. If you are considering a move to or within Mueller, give him a call on 512 215 4785. I am interested in finding out more about one story detached houses in Mueller. Please let me know if you have any plans to share with me. We’ll get you something in the email right away!